, against the greenback on Wednesday amid trade war tensions and rising crude prices. 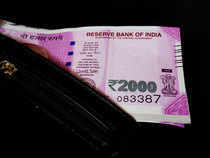 The rupee opened 19 paise lower at 68.43 against the dollar. The domestic unit on Tuesday ended at a fresh one-week low of 68.24, depreciating by 11 paise against the US currency on increased dollar demand amid global policy uncertainties. Steady capital outflows and a modest rise in crude prices also added some pressure on the local currency. Oil prices rose on Wednesday following supply disruptions in Libya and Canada and after US officials told oil importers to stop buying Iranian crude from November, Reuters reported. Brent crude futures rose 15 cents, or 0.2 per cent, to $76.46 per barrel at 0146 GMT, from their last close. US West Texas Intermediate (WTI) crude futures were at $70.70, up 19 cents, or 0.3 per cent. Most Asian stocks declined as concerns lingered over the impact of global trade restrictions. The dollar and Treasury yields were steady, Bloomberg reported.